"Nothing dreadful ever happens in a musical"
"Dancer in the Dark" is actually a completely accurate title, just don't be mislead by the romantic connotations it might conjure. This is one special film and in some ways fantastic. Yet at the end of the day, it's as edgy and risky for a night's entertainment as the lead actress herself -- Björk who was born and raised in Iceland. Her music reaching and daring into un-pop territory, she's released some 14 albums by her current age of 34. Shot mostly in the now not-so-fresh-and-exciting "guerilla video style" of films like "Blair Witch", "Dancer" finds refuge (and indeed we the audience do as well) in wonderful "musical" interludes. There, the colors are fresher, the cameras stabilize, and the sound track fills with music noticeably absent from the real world segments meant to portray Björk's gritty factory-worker life in the most abrasive manner bearable. Our reward for tolerating the overly wobbly videography and awkward editing is Björk's stunning performance and a 100-cam view (as if inside-her-mind's-eye) of her daydreams offered us via the handful of musical interludes where coworkers break from their normal concrete lives and burst into song and dance. "In musicals nothing dreadful ever happens." Unfortunately, Björk cannot say the same of her hard life as a single mother working multiple jobs in order to pay for an eye operation for her son Gene. From not-so-good to worse, Björk's story progresses, with the six or seven fantasy reprieves. Strong acting and direction grace this bold film, with choreographed moments by Vincent Paterson of "Evita" and "Michael Jackson" fame. 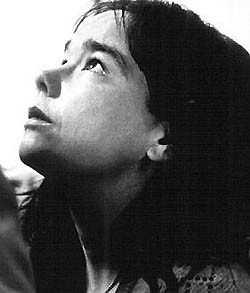 Björk's music is eclectic and unusual. Imagine Grace Slick fronting for a moody B-52's or Eurythmics tune while an industrial crunch replaces the drummer. Struck by her unique face on a poster, I sampled her music some years back and decided I liked the poster better. However, in this film, her music not only works, but fastens the scenes together with rivets. I personally found the hand-held panning video camera tiresome, but loved the shot from the vidcam mounted on the wheel of Gene's bicycle just under the clothespins clamping a card to flutter off the spokes. The card's sound is cleverly captured in the soundtrack. Whether you enjoy this piece or not, this film will linger (perhaps "haunt" is a better word) in your mind for days afterward. Interestingly enough, one of those Dogma 95 filmmakers, Lars Von Trier set this film in America, but filmed in Sweden; greatly due to the fact that he simply doesn't take airplanes. Dancer in the Dark. Copyright © 2000. Starring Björk, Catherine Deneuve, David Morse, Peter Stormare. Written and directed by Lars Van Trier. Produced by Vibeke Windelov at Zentrope/Trust/Film I Vast/Liverator.